I've reviewed a wonderful book on the green belt for the Guardian. 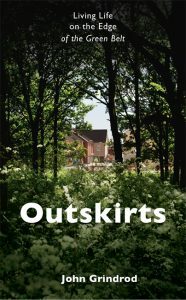 Outskirts: Living Life on the Edge of the Green Belt is by John Grindrod, author of Concretopia, a celebration of postwar British architecture (“I do love a bit of concrete”). Grindrod's wonderful book struck a chord with me. I also grew up on the fringes of London in the 1970s, near the green belt. My parents lived in a rather unlovely 1930s semi on the outskirts of Romford, not far from the rather more desirable garden suburb of Gidea Park, which was inspired by Ebenezer Howard's idealistic vision of a decentralised urban future. "Town and country must be married," Howard had gushed, "and out of this joyous union will spring a new hope, a new life, a new civilisation." As Grindrod shows, it was largely Howard's vision of garden cities that inspired the green belt, an urban planning compromise designed to limit the growth of big cities such as London, a barrier to save the countryside from an all-consuming tide of subtopia. I was never particularly keen on Romford (although its raucous, colourful market was memorable) but I loved the sense that green spaces were never too far away.